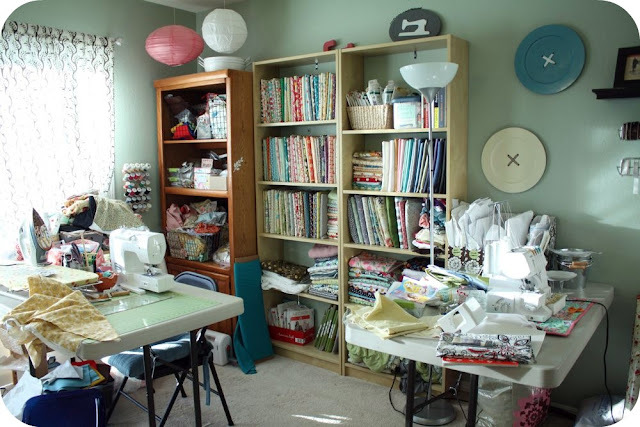 You can see my previous post about the sewing room here…looks like I need to do an update sometime! Here’s what’s on each shelf for you gotta-know-it folks! Bottom two shelves: larger cuts of fabric and on the bottom all my Go Baby dies and some patterns. 1/2 yard cuts and solids. Oh, and ignore my fallen-over pink J…I haven’t quite decorated the top yet, and this was my attempt…which obviously failed. ;} That cool sewing machine sign thingy bob was made by my brother for me (Christmas gift), and on the top, cut out (with a laser cutter machine), is the name of my blog. Cool, huh? So yep. This is what it looks like most days, it’s actually pretty cleaned up! That is my aim in life! Well done. Presently, my fabrics are in plastic bags (so they can be seen), sorted into colours – roughly) jammed into cupboards (where I forget in which order I’ve put them away, and the bits that don’t fit are stored in our storage unit – which just happens to be about 12 miles away from home! Not satisfactory, really, but – when you’re living in an apartment built for old folk who aren’t supposed to have a hobby, let alone a mini-business, that’s what happens. Enjoy yourself – bet it won’t be long before you need some more shelves! Your shelves look great! I just moved my stash from tubs and into a gorgeous set of shelves. I thoroughly enjoyed the patting and folding as I sorted my stash. And nice job on the shelves. I feel like keeping a sewing/craft room organized is a perpetual process since you’re always using some materials up and buying new ones! Love the organization!! It’s a passion (or obsession) of mine. I’m also wondering about the comic book boards. I like the idea of a mini fabric store. Right now I use clear rubbermaid tubes. Effective… not eye candy. Also I’d like you advice. I’m looking to build my stash. What do you find is a good amount of fabric to buy when you encounter a must have piece. 1 yard, 1 1/2 yards… 2 yards? I know it depends on price,etc. I always get stopped by thinking I don’t want to buy it and then be needing more without being able to find it again. Any suggestions? What Go Baby dies do you have? And why aren’t we neighbors, again?? 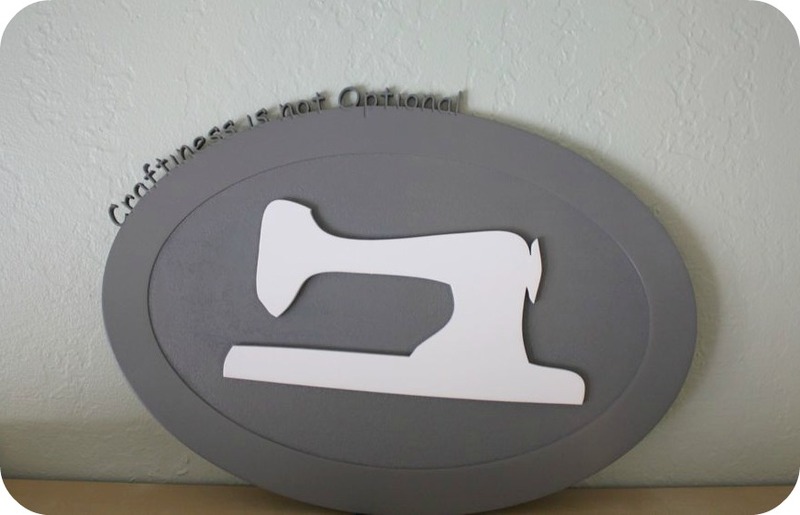 Love your sewing machine CINO sign!!! Amazing. 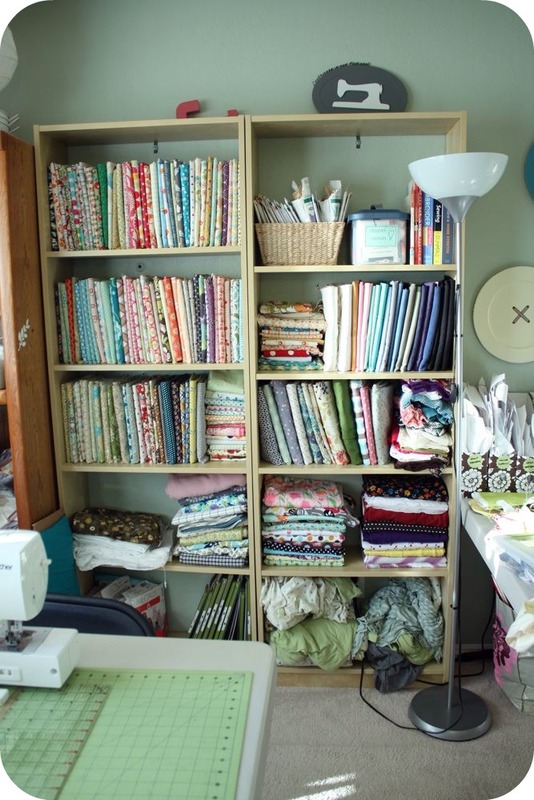 Thanks for sharing, I love looking at people’s craft rooms. It looks great! I have bought the comic book boards too. I started with two packages and have more to go, so I went ahead and order three more packages! I found them for about $10 and by ordering three I got free postage. I’m trying to figure out how to use them with my fat quarters too. My problem is not having the shelves to put them on. I’ll have to check out Ikea! LOVE seeing how others organize their spaces. Thanks for sharing. I need to get some comic book boards for my fabric… LOVE the looks of it! Where did you get the giant buttons? LOVE those! And this is probably a silly question, but I think I remember reading here somewhere, that your GO! Baby was a free promotional thing for you? Is that right? How did you get into that? Do you know of any other giveaways for one? I’ve loved to see all that you’ve done with yours, but it’s a bit pricey, so I’d love any advice. I’ll probably just need to start a fund. @ Jen-I will usually buy 1.5-2 yards of a must have fabric, that usually is enough for my types of projects. Your new shelves look great! I am in envy of all your beautiful fabric. I also use the comic book boards for storage. If you cut them in quarters, they are the perfect size for fat quarters. Makes everything look so neat. Wish I had a whole room for sewing, I only have a corner and a shelf. ( it is also our spare bedroom ) you are so lucky! what do you do with all your small scrap fabrics?! Mine are in, well spilling out of, a box on the floor that I sift through when I am looking for smallish pieces (less than 1/2 yard to scraps), but I feel like there is a better way that I can’t seem to figure out. I know for quilters they just cut them up and organize them, but I am more like you with crafting…any advice?! It looks great and the fabric is so organized! Love it, thanx for sharing! 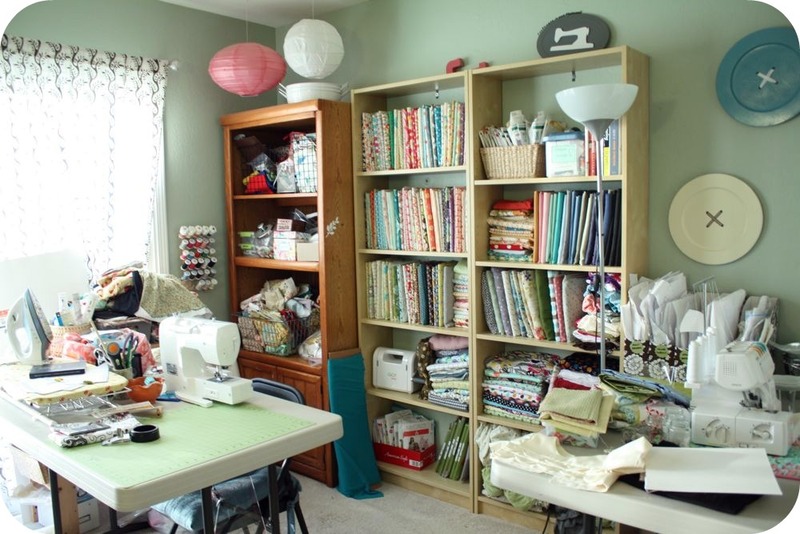 Oh wow, I so want your sewing room! I was drooling big time at your material stash -WOW!